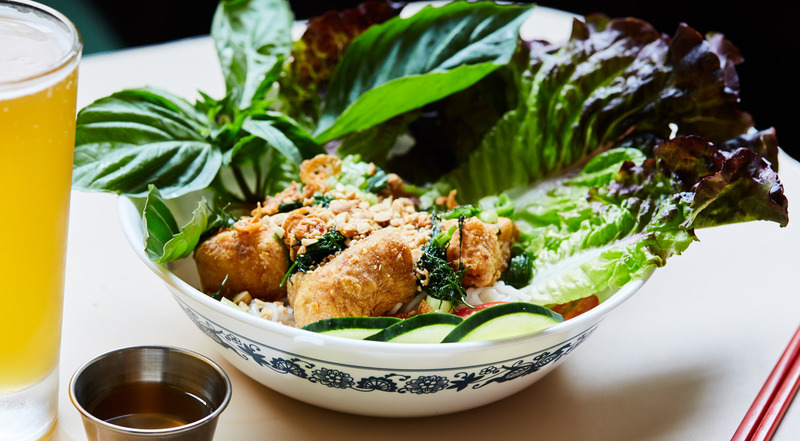 Ridgewood’s Vietnamese food phenom Bunker relocated last year and opened in January 2017 their 2.0 restaurant in industrial-hip Bushwick. 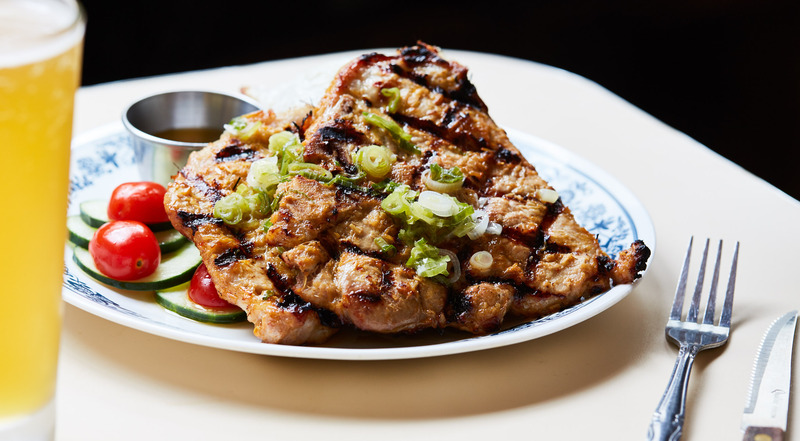 Surrounded by factories, the acclaimed chef-owner Jimmy Tu has taken Bunker to the next level. 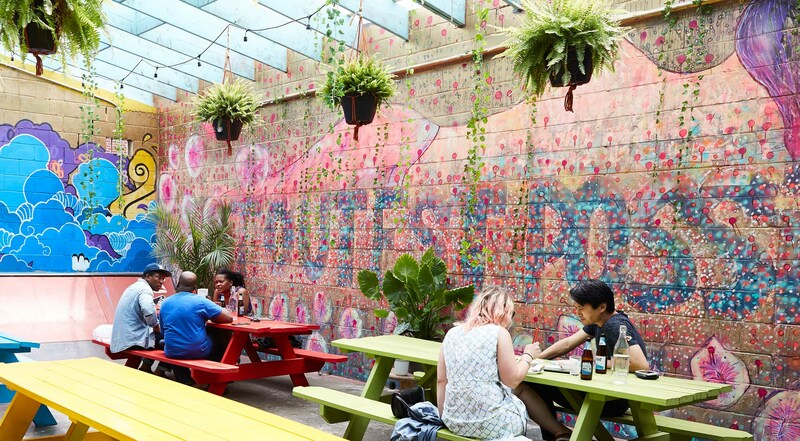 The space is decorated with wild plants, paper lanterns, colored lights, and an old quarter pipe skateboard ramp. 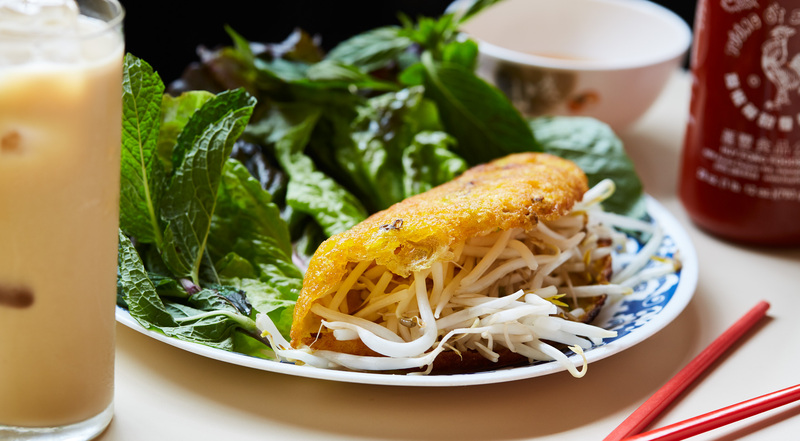 Chef Jimmy’s version of Vietnamese street food has attracted weeknight waits, and crowds come from across all of NYC. Pick whatever you like at hip Bunker in Bushwick. Every voucher has a value of $40. Purchase one or more vouchers. Go for delicious Vietnamese starters such as fresh summer rolls with crab and wild prawns to vegan rolls with homegrown mushrooms and peanut sauce. 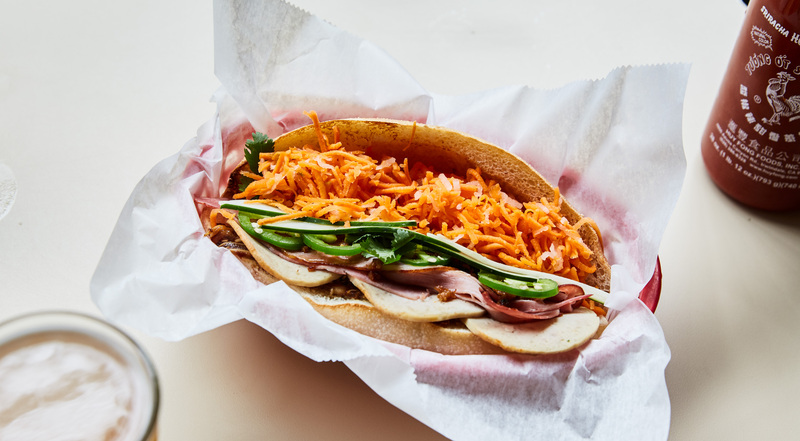 Taste Bánh Mì sandwiches with everything from grilled lemongrass short rib to crispy wild fish of the day and exotic mushrooms. Opt for the Vietnamese Phô with rice noodles, oxtail or grass fed rare beef. Taste mouthwatering main dishes such as caramelized wild shrimps, heritage pork chop and chicken curry with coconut milk and lemongrass. Get the Surf & Turf with grilled shrimps, short ribs and peanut. Opt for the mushroom fried rice with organic egg and cashews. For dessert, indulge in coconut tapioca pudding, the black sesame or coffee ice cream. Combine your lunch or dinner with sweet Vietnamese iced coffee, homemade thai basil seed limeade, wines, cocktails and much more. Great food. Great service. Great cocktails. The food is absolutely delicious. Will definitely come back again! Fabulous food, fun atmosphere, friendly staff and awesome drinks! The food here is top quality! 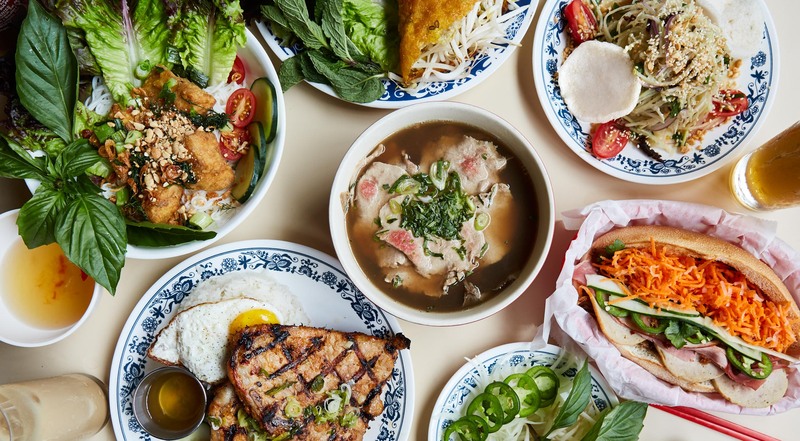 The very best Vietnamese food NYC’s has to offer combined with great vibes, cool interior, friendly service and monthly performances by acclaimed DJs from around the world. Bunker shares homestyle Vietnamese street food at the highest gastronomic level, and it’s no surprise that Michelin has awarded Bunker with its coveted 2018 Bib Gourmand status. Bunker is one of those kind of places, where you instantly feel welcome. Everything is self-build, from the indoor bamboo wooden bar to the outside covered garden. The walls are painted by talented graffiti artists and painters. 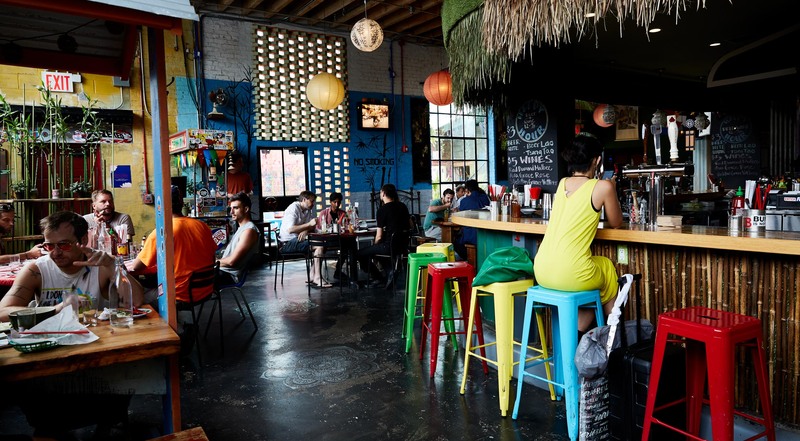 The food is incomparable to what you have tried before, the produce is locally sourced and in the basement, Bunker experiments with homegrown Vietnamese mushrooms.